Anchor Bay Entertainment and Amplify recently send us information for the upcoming DVD release of the Better Angels. The film stars Jason Clarke (Zero Dark Thirty, The Great Gatsby, Lawless), Brit Marling (Arbitrage) Diane Kruger (“The Bridge,” Inglorious Basterds). No special features were announced at this time. "The Better Angels" hits retail on 3/3. 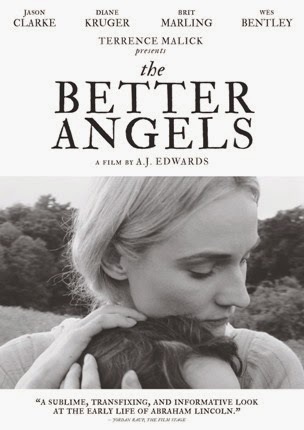 On March 3rd, on the heels of the 150th anniversary of Abraham Lincoln’s death, Anchor Bay Entertainment and Amplify will release The Better Angels, produced by Terrence Malick (Academy Award® Nominee, The Tree of Life, The Thin Red Line) and directed by A.J. Edwards (The New World, The Tree of Life). This compelling portrayal of the man himself premiered at the 2014 Sundance Film Festival and has since become a critical favorite in film festivals across the United States. The Better Angels will be available on DVD for an SRP of $22.98. In an isolated log cabin hidden in the wilderness of Indiana circa 1817, a youth is growing up. Against all odds he will grow to be one of our nation’s greatest heroes: Abraham Lincoln. The Better Angels is an evocative portrait of the future president, exploring his formative years and a life within a harsh yet beautiful country; a country experiencing the throes of growing up as well. The young Abraham is played by newcomer Braydon Denney in a sensitive performance, as an intelligent child rather than a future adult destined for greatness. His relationships with his father (Jason Clarke, Zero Dark Thirty, The Great Gatsby, Lawless), mother (Brit Marling, Arbitrage) and stepmother (Diane Kruger, “The Bridge,” Inglorious Basterds) define his character in scenes that are sympathetic and beautifully wrought. Using black and white cinematography to create an atmosphere that is both subtle and stark, The Better Angels sheds new light on the early years of the future president. Adapting the unique premise of using contemporary 19th-century interviews with Lincoln's family members it is a perceptive look at the youth who would become one of the most revered men in American history.